Learn how to make sketchbooks exactly tailored to your needs. 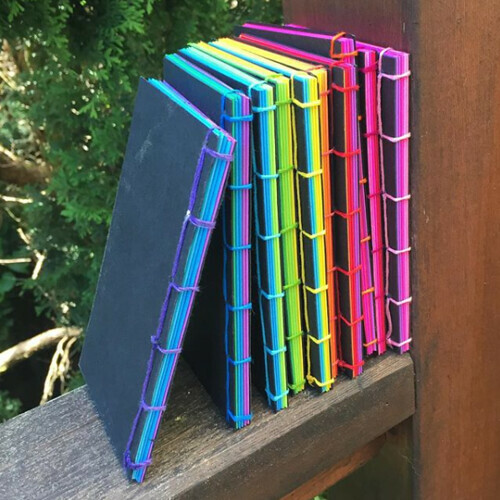 We will explore a variety of simple book structures to make range of sketchbooks from quick pamphlet bindings you can stitch together in a few minutes, to a hardback book that opens flat. Our final project will be a traveling sketchbook box that hold a small watercolor set and your pens. Good hand skills recommended. Students may need to supply specialty paper for their own books. Marilyn Zornado has been combining her love of book arts, calligraphy, poetry and animation for twenty years. Her animated films include “Insect Poetry” and “Spring Lines.” Her latest effort, “Old­Time Film” was co­-created with Barbara Tetenbaum and was animated entirely using letterpress printing. Marilyn has a MFA in Computer Animation.